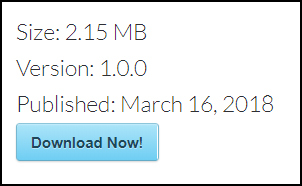 Using the Simple Download Monitor & Manager Plugin, you can easily display the Publish Date, File Size and Version Number of your downloads. When you enable these features, the details will show when you use the fancy download display. Added details about your download allow your users to decide if this download is right for them. The version number acts as a reference so that users can ensure they have the latest version of the download you are offering. You can choose to display one or all of these features: Publish Date, File Size and Version Number. As admin, you also specify which downloads these additional details apply to. Step 1) Edit the Download that you’d like to add the Publish Date, File Size and Version Number to. Step 2) Within the Edit Download page, locate the Other Details section. Step 3) To add the File Size, enter the size (for example, 2.15 MB) in the appropriate field. Mark the checkbox below to ensure this detail shows when using the fancy display. Step 4) To add the Version Number, enter the number (for example, 1.0.0) in the appropriate field. Mark the checkbox below to ensure this detail shows when using the fancy display. Step 5) To add the Publish Date mark the appropriate checkbox. Step 6) Ensure you Update the download. Step 7) Now when you add this download to a post or page using the fancy display shortcode, these additional details will be displayed. When you add the download to your website using the fancy display shortcode [sdm_download id=”0″ fancy=”1″], the additional details you have configured will be shown to your users. The Published Date, File Size and Version Number of a download (using the fancy format) is displayed in the screenshot below.